Visit the breathtaking island of Guernsey today by taking one of our magnificant ferries from either our Weymouth or Poole Terminals.Condor Ferries Guernsey Terminal, located in St. Peter Port, is easily accessible and offers a range of facilities. 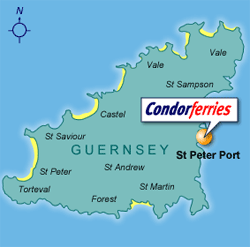 Condor Ferries Guernsey services operate between Guernsey, Jersey, St. Malo, Weymouth, Poole and Portsmouth. Travel high speed to Brittany arriving in St. Malo in just under 3 hours, or travel inter-island to Guernsey from just 55 minutes. Our high speed UK routes take you to Weymouth or Poole from 2 hours 30 minutes. For a more leisurely crossing, travel overnight to Portsmouth on our conventional ferry. Guernsey like Jersey is a truly beautiful little island with breathtaking beaches and scenery, not to mention filled with culture & history making it the perfect place for a holiday. With an environment that is as conducive to outdoor pursuits as Guernsey’s, it is not surprising that a range of sporting and other activities are available including cycling, diving, angling and sailing. Guernsey’s west coast can also provide excellent surfing and windsurfing conditions. Guernsey can easily be explored by bicycle, with a choice of 6 designated cycle routes across the island. Guernsey also provides opportunities for scuba diving, kayaking, horse riding and golf, amongst many other activities. With its scenic harbours, quaint cottages, beautiful countryside and sandy beaches, this friendly island is virtually one big picture postcard. The island's capital, St. Peter Port, is a vibrant harbour town offering bistros, restaurants and boutiques. The Guernsey Aquarium, housed in La Vallette Tunnel, is the location of forty-seven separate displays, ranging from local sea fish to European freshwater fish and finally to tropical marine fish, anemones and inverts of various kinds. Another popular family favourite is the Little Chapel, which is beautifully decorated with seashells, pebbles and colourful pieces of broken china, and is possibly the smallest chapel in the world. Guernsey most certainly has it all rural beauty, stunning cliff paths & breathtaking scenery and is without a doubt the perfect holiday destination. For eating out you can choose from pub fayre, bistro dining or contemporary cuisine. There are a huge variety of culinary styles available from all over the world. Indian, Turkish, Spanish and Italian sit comfortably alongside more traditional restaurants. St. Peter Port also has a good choice of lively pubs and bars where you can soak up the atmosphere, along with a few cocktails or locally brewed ales. During October and November, Guernsey is the location of the ‘Tennerfest’ festival, offering mouth-watering menus from just ten pounds. Over 100 miles of coastline is the setting for sandy beaches and dunes, secret coves and rock pools, rugged harbours and endless, beautiful cliff walks. From the long sandy sweeps on the west coast to secluded caves in the south, Guernsey offers more than 25 beaches. Three of Guernsey's beaches, L'Eree, Grandes Rocques and Port Soif, have recently won Good Beach Guide recommendations for water cleanliness. St. Peter Port offers a mixture of well known high street stores and more unique individual shops. Many of the retailers in Guernsey offer low duty free prices on a range of items. Big savings can be made on jewellery, photographic and electrical goods.